Meghana Iyer, Bobby Scalia and Mathew Zappa love science. 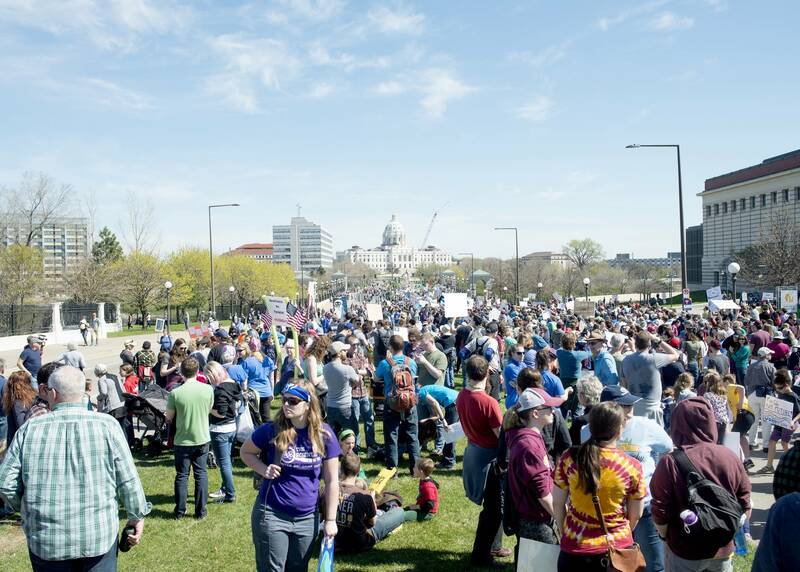 In fact, the Edina High School students were happy to spend their Saturday morning among the thousands of demonstrators at the March for Science Minnesota in St. Paul. "I've always been a data driven person. Always looking for facts to support whatever I'm looking for. And I've always been asking questions," said Iyer, 17, a senior. That curiosity and passion led her to start Edina High School's Science Bowl team three years ago. And next weekend, they'll head to their second National Science Bowl. And, like others in the scientific community, they have concerns about the future of their favorite subject. 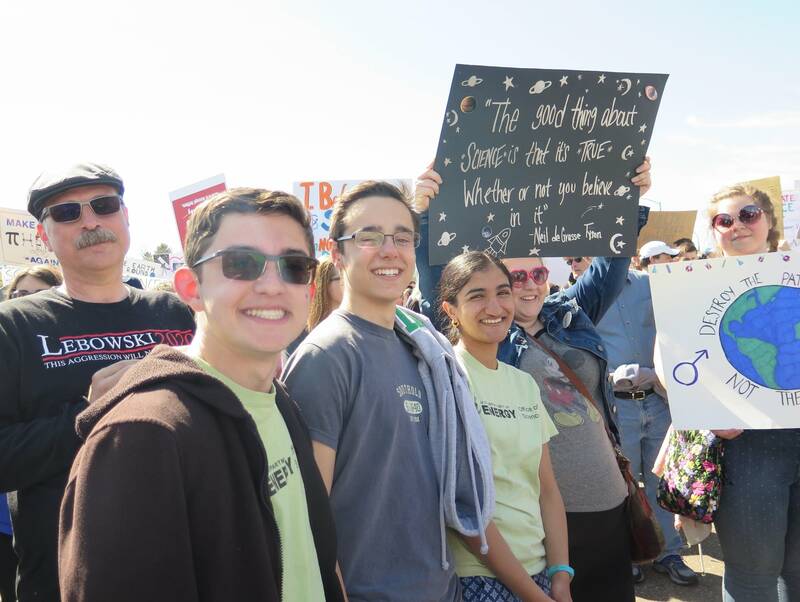 "The cuts to science that are being proposed right now in the government definitely concern me, because America, and the progress of America has always been founded on good science," said Scalia, 17, a junior. Zappa agrees. He's worried the Trump administration could cut back on funding for scientific research. "I'm really into nature, ecology and climate change, and all the human-caused issues that really affect the environment," the 16-year-old junior said. "And if climate change research is being supressed, that could really have impacts on nature and the ecosystem." The three teammates arrived at the Cathedral of St. Paul an hour early. It was their first time participating in a political rally. 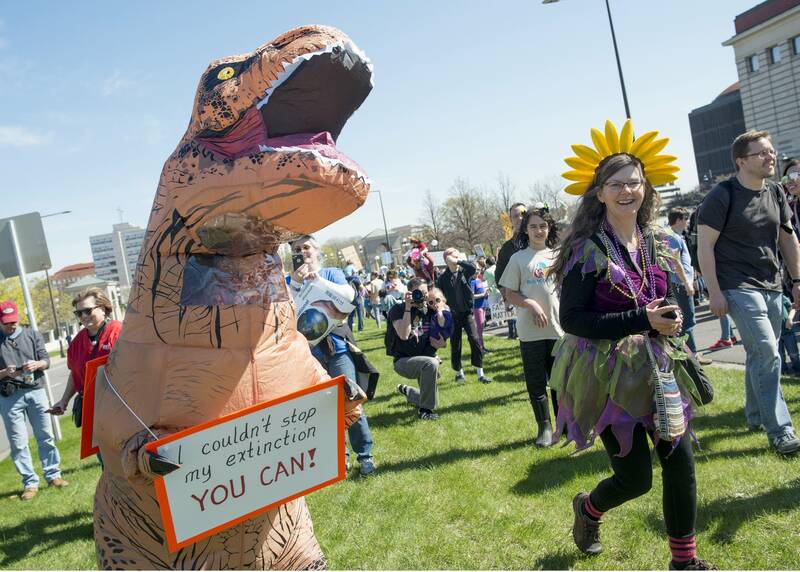 They watched as demonstrators began gathering - some wearing lab coats, some dressed as famous scientists like Albert Einstein and Rachel Carson and many people carried signs, often with science jokes or puns. "I saw a sign that said Tyson/Nye 2020 for Neil DeGrasse Tyson and Bill Nye and then a little girl wearing a chemist coat, which said future chemist. That was a really cute," Iyer said, smiling. Scalia added that he liked the multiple signs that read, "There is no planet B." Halfway across the Kellogg Boulevard Bridge, the students could see the entirety of the crowd, and stopped to take photos in both directions. The St. Paul Police department estimated there were around 10,000 people. Zappa was happy to see so many people supporting science. "It definitely makes you feel heartened maybe that there's this many people just in the Minneapolis area support science and scientific advancement," he said. They made their way around the main crowd and up onto the capitol stairs, where they could see all of the demonstrators gathered below. "Just to see all of these people here is very encouraging," Iyer said. "And especially before we leave for nationals next weeks, I think it's just a great way to feel that larger sense of community here. It's really empowering. I'm really, really happy I came."